Osram Son-T-Plus grow lamps are top spec flowering bulbs which provide about 3-4% more light (lumens) than entry level 1000w sodium lamps. Osram Son-T-Plus bulbs are extremely well engineered to perform exceptionally in all situations. 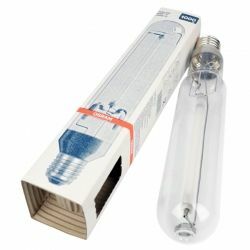 1000w Osram Son-T-Plus Sodium Bulbs will fit any reflector with an E40 lamp holder and require a 1000w ballast or powerpack to run.